Which business model is best for me? There's no easy answer, but we'll help demystify the choices. You want to open your own tobacco shop. You've got the location. The name. Maybe you've even lined up the inventory, some potential employees, and a basic marketing strategy. But before you have your grand opening you've got to let the state know what form your new business will take. If you've got an accountant, this is one of the first questions he'll ask. Or, as an existing retailer, perhaps you're questioning whether the business model you first selected is still the best choice for you now. There are lots of choices and like everything else, each has its own strengths and weaknesses. Whichever form you choose, some of the ramifications will include liability, tax, and credit issues. The basic forms are: sole proprietorship, partnership, and corporation. With the exception of sole proprietorship, there are several "sub-forms" within the categories - all created to accommodate business. "This is very difficult question to answer as the entities can be quite complex, says Larry Little, a CPA with the A.C.T. Group, Ltd., an accounting firm in Chicago, Ill. with a lot of small business clients. "Is there one structure that works best for tobacco retailers?" asks Little. "No. Depending on the circumstances, all the entities offer different pros and cons. However, most small business owners with no significant additional personal income choose the S-Corp. However, individual circumstances may change the answer." The eight-hour days at the office, a grinding commute, and vicious company politics may make running your own tidy cigar shop seem like a fantasy. But if you go it alone, be prepared for 15-hour days, little to no vacation, and around-the-clock worry. Unless you can afford to pay (and find) reliable help, you'll be responsible for opening and closing the shop, satisfying cranky customers, ordering, managing inventory, keeping records, paying bills, taking out the garbage, doing repairs, and handling everything else that comes along. Ahh, the joys of independence. But going it alone does have its privileges. Sole proprietorships are the oldest and simplest business structures. There are no other business owners or partners to answer to; you are the business. You'll need to file a Doing-Business-As (DBA) form with your state, but that's about the extent of the bureaucracy you'll face. Come tax time you file a Schedule C with your personal income taxes and maintain simple bookkeeping, listing income against expenses. What's left is your profit or - in less fortunate cases - your loss. On the Schedule C, a "professional activity code" identifies the type of business in which you are involved. You may, however, be able to use the short variety, Schedule C-EZ. For retirement, you can open an Individual Retirement Account (IRA) with nearly any financial institution or a Keogh plan. Liability, however, is also all yours, and nothing separates your business from your personal assets. If, for example, you hire a driver to deliver some cartons, and he has an accident on the way while driving your car, you're personally liable - which means you've got to look into insurance. Income and cash flow can be erratic, and you will have a tough time building equity unless you buy the real estate in which your business is housed. If you die during the time you're running this business, it is automatically dissolved. What's left to heirs is a personal estate, not business equity, company stock, or other tangible investment. And there are no corporate benefits such as a health or retirement plan. Vacation is for how long you can get away from the store. In most cases, don't expect to take one during the first year. "I took my first vacation about one year after opening my store," says Michelle Tuchman, proprietor of Uptown Cigar in Kingston, N.Y. "It was a working vacation. We went to the RTDA in Orlando," she says with a laugh. Tuchman, a former registered nurse, opened the store in 1996 because she always liked cigars and had achieved some success with another small business she ran earlier with a friend. The store's always been open six days a week, and it now has three full-time employees plus a part-timer. She's considering changing its status to an S-Corp due to liability concerns. "This is a fun place to be," Tuchman says about her store. "Everyone is here because they want to be - the customers, the employees, and me." While most businesses start as sole proprietorships due to the simple operating rules, when annual income reaches over $100,000, the protection afforded by a more formal structure, may be advisable, despite the extra costs. A general partnership is formed when two or more individuals come together to run a business. They generally work best when partners provide complementary skills. Like a sole proprietorship, partnerships do not require special registration and each partner assumes liability for the businesses' debts and obligations. A written agreement is not required but it's probably a good idea to agree on the major responsibilities early in the relationship. We've said a few scary things regarding liability here. You can purchase liability insurance for either a sole proprietorship or partnership to limit your responsibility. This may not be a bad idea. According to David Kaplan, author of How to Start a Business for Free, partnerships break up about as frequently as marriages - roughly 50 percent of the time - and they can be just as emotionally and financially devastating. For tax filing, you'll need a Schedule K-1, part of Form 1065; it is mailed to you if you participate in a partnership. It lists the income paid to you during the year, expenses incurred by the partnership, and credits due you if applicable. If one or more partners will run the day-to-day affairs of your shop and still others are interested in investing but not participating in any other way, they can join as passive investors and you may want to consider forming a "limited partnership." The passive partners are only liable to the extent of their investment in the company but the general partners are personally responsible for its debts and have no restriction if they wish to sell their interest to a third party - consent from the other partners is not needed. However, in these arrangements there must be at least one general partner and one limited partner. The general partner is exposed to all of the company's liabilities. And like a proprietorship, a limited partnership avoids double taxation. Setting up and operating a limited partnership is very similar to starting a small, for-profit corporation. The California Limited Partnership Act requires filing with the Secretary of State, applies restrictions on the use and availability of partnership names, contains statutory requirements governing calling and holding meetings, and contains many corporation-like requirements. Interestingly, death, disability, or withdrawal of a general partner dissolves the partnership unless the partnership agreement provides otherwise or all partners agree, in writing, to substitute a general partner. Death or incompetence of a limited partner, however, has no effect on the partnership. Since limited partnerships can accommodate many objectives, different individuals and personal backgrounds, state governments often scrutinize these relationships. A Limited Liability Company (LLC) has some characteristics similar to those of a limited partnership, some corporation-like characteristics, and still other unique characteristics. Its main attributes are that it identifies partners and their roles and how disputes or sales will be managed. However, if you're a single-member LLC, the Internal Revenue Service will treat you as a sole proprietor so you do not have to file an additional tax return in addition to the Schedule C and distributions are subject to self-employment tax. A multiple-member LLC must file Form 1065, U.S. Partnership Share of Income, and prepare a balance sheet. As a single person, you get the benefits and liability protection of the LLC without having to file an extra return. The so-called "C-Corp." is the standard, general for-profit, state-formed corporation. To form one, you (the Incorporator) must file Articles of Incorporation and pay state fees and prepaid taxes, usually with the Secretary of State - Corporations Division. One of a corporation's most appealing aspects is that it is its own entity. It must have shareholders, officers and a board of directors and pay taxes in its "name" with IRS Form 1120. And while directors generally form policy and make major business decisions for the corporation, they do not individually represent the corporation in dealing with third persons, which is handled by corporate officers and employees. This removal of personal liability is one of a corporation's most attractive features. In most states, one or more persons may form and operate a corporation, but there are exceptions. Corporations may enable owner-employees to deduct health insurance premiums paid by the corporation from corporate income. Corporate benefit plans usually offer better retirement choices and benefits than those from non-corporate plans. Owner-employees are paid salaries and fringe benefits that are deductible to the corporation. A corporation is a separate legal entity, capable of continuing indefinitely. Its existence is not affected by death or incapacity of shareholders or officers and it enjoys some of the constitutional protections granted to "real" people. However, to maintain a corporation - and reap the benefits - those running it must observe corporate formalities including annual meetings with corporate minutes taken, the appointment of officers, and the issuance of stock to shareholders. When corporate formalities are not observed, shareholders may be held personally liable for corporate debts. If a corporation is poorly capitalized and funds are commingled with employees and officers, stock is never issued, meetings never held, and other state-required regulations not followed, a court or the IRS may "pierce the corporate veil" and hold the shareholders personally liable for debts of the corporation. Want the corporation's limited liability and the partnership's "pass-thru" tax-treatment? Then consider the S Corporation. 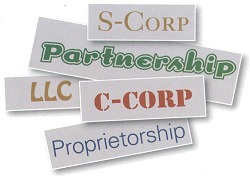 An S Corp. begins as a general, for-profit corporation when it files its Articles of Incorporation with its home state like an ordinary corporation. However, after the corporation is formed, it may elect "S Corporation Status" by filing IRS form 2553 - in some cases a state filing is also required. An S-Corp. is often advised when shareholders are employed at least half-time within the corporation and/or considerably participate in the corporation's daily activities or if it plans to distribute most of its income to its shareholders each year. Choosing a business structure is an important decision and there's a lot more to know than what's covered here. While the information contained in this document is thought to be accurate, it should not be relied upon for legal business advice. Speak with an accountant or C.P.A. before deciding.